Pippins class have been making some brightly coloured butterflies to go on the windows and learning all about how caterpillars turn into butterflies! We are hoping to have some pet caterpillars next term too! This week Acorns have been singing Humpty Dumpty and exploring eggs. We watched what happens when we drop an uncooked egg and a cooked egg and looked at the differences between them. We did some egg rolling in paint and tried to put pieces of Humpty Dumpty back together again! Oaks have been finding out about all the different jobs people do around the school as part of their ‘People Who Help Us’ theme. They went for a walk around the school and called into the prep school office, the pre-prep office and of course the kitchen where they found Karen and her team working hard cooking lunch. The children wanted to pop into Mr Jones’ office to see him but as he was away in Russia, they decided to have a cheeky sit on his sofa instead! 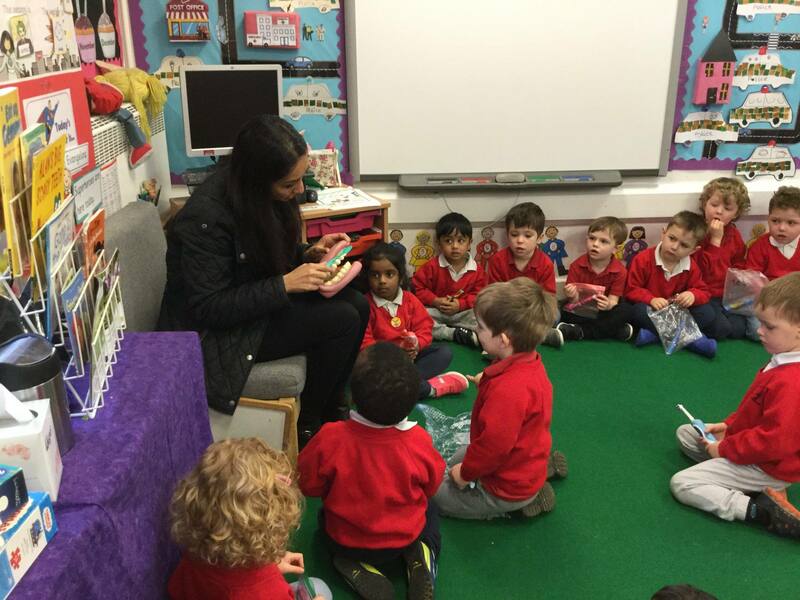 Oaks also happily welcomed Aarav’s dentist mummy (year 2) to talk about keeping their teeth clean and healthy (visit rescheduled from last week). All the children brought in their toothbrushes and were shown how to clean their teeth properly… we hope the good habits are being reinforced at home!